9/21/08: He was a great man, whom I loved very much. It is hard to believe you will be seven weeks old tomorrow! Life has been very busy since your arrival. Your mother and I are both in school, and every single day seems to just fly by. Sadly, you have already had to embark on one unintended adventure. 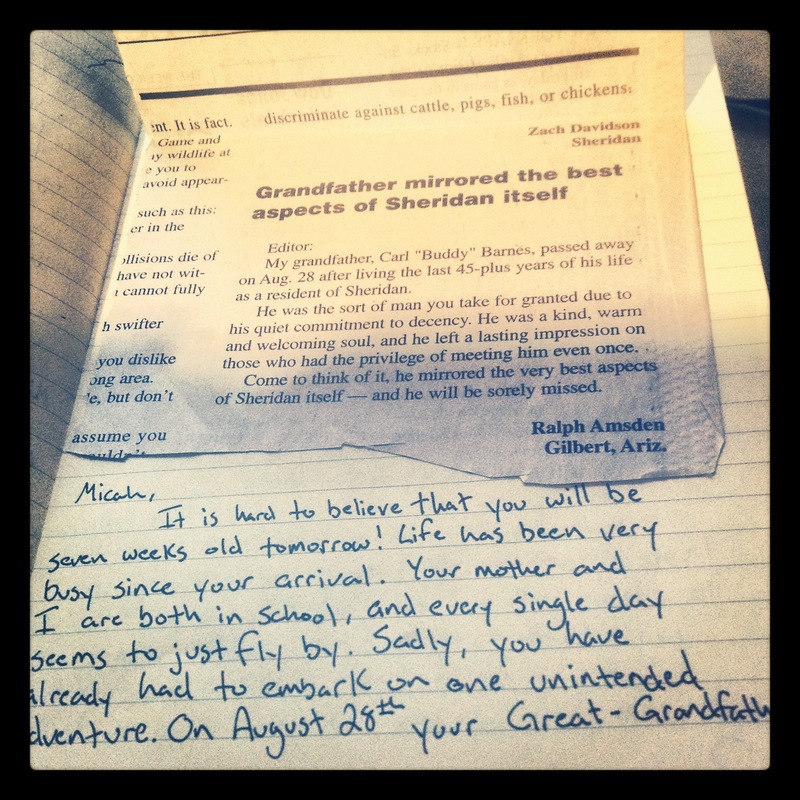 On August 28th your Great-Grandfather passed away. He was a great man, whom I loved very much. I will forever regret that he did not get to meet you. We took you with us to his funeral. Long story short, you were in 5 states before you turned 5 weeks old. We even stopped in Yellowstone National Park, where your mother got a little too close to some bear cubs for my comfort. For your sake, she better not do that again. I can’t raise you by myself. Seriously though, it has quickly become my greatest joy to see how much your mother loves you. You are a beautiful baby, and we thank God for you every single day. Next Post: 8/10/11: Then I bled all over the thing and no one got a snack.